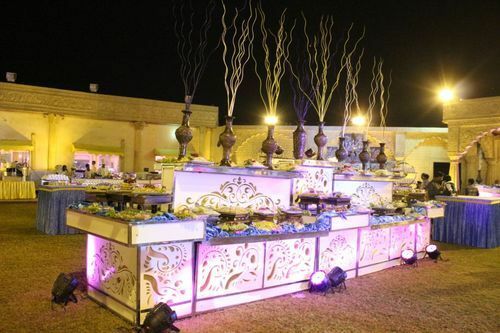 Our organization is engaged in rendering Wedding Catering Services in Gurgaon for the clients. For wedding of all religious communities, we offer these Wedding Catering Services in gurgaon. We have exotic and scrumptious menus, which delights the mood of the food lovers. For creating a lip-smacking feast, guests can choose the appetizers, entrees and desserts. These cratering services are rendered by our experienced chefs. We are dedicated and highly proficient in this domain of offering excellent Catering Services at different Events and Parties. Our team is specialized to handle various types of events and parties in a personalized manner and make sure that every event is handled in a separate way. We offer our customers with a wide and distinct menu of dishes at reasonable rates and source all the ingredients and vegetables, fruits/meats from reputed vendors in the market. Our range of offerings includes Kitty Party Catering Services, Birthday Catering Services, Marriage Catering Services, Corporate Catering Services and Event Catering Services. Apart from providing delicious, lip smacking and healthy food, we take great care in presenting the food aesthetically. Well-maintained and highly clean crockery is used for serving purposes. We also have with us uniformed staff, friendly and highly cooperative offers that assures the hosts and patrons of a memorable occasion. Our services are organized meticulously and attractively and we ensure complete satisfaction by offering special dishes for all occasions. Due to the nature of the event, we assure our patrons of impeccable hospitality to all the guests at various events that are planned by our team of experienced professionals and our services gives it a novel identity and meaning.